This article is about the level from New Super Mario Bros. U. For the level from New Super Mario Bros. Wii, see World Coin-3 (New Super Mario Bros. Wii). 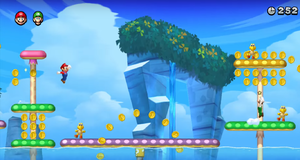 World Coin -3, or Coin Courses-3, is the third level in the multiplayer exclusive Coin Courses in New Super Mario Bros. U. This level is located in Sparkling Waters. The course is given a difficulty rating of two stars. The positions given below are the default layout, and can be changed by a player using the Wii U GamePad in Coin Edit. Star Coin 1: Near the start of the course, the inner ring in the two spinning rings of coins contains a Star Coin. Star Coin 2: Near the Checkpoint Flag, just above four mushroom platforms near the water's surface. Star Coin 3: Later in the course, in a ring of coins spinning around a pink stretching platform. This page was last edited on April 12, 2019, at 02:31.